Your Initial Visit - Prosthetic Dentistry of Washington D.C.
We will review your medical and dental histories as well as any specific concerns you have at that time. Should you have a dental problem that needs immediate attention, we will make every effort to provide you with the appropriate care during your first visit. To save time in our office our Patient Registration Forms are available for you to fill out at home before your appointment. Please remember to bring the completed forms with you to your first appointment. If you have dental insurance, we will provide you with the necessary information to expedite your insurance reimbursement. 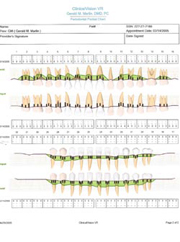 A comprehensive examination will be recorded in a charting that included an analysis of your existing restorations, your soft tissues to rule out lesions, a periodontal charting (a gum and bone support assessment), and an evaluation of your occlusion (bite). Additionally, we will evaluate any X-rays and/or models that you have brought, or if necessary, we will take Digital Radiographs and Digital Images (intraoral pictures) to supplement your records. A Full Mouth Set of X-rays is a critical tool in diagnosis. If your dentist has taken X-rays, you may request that they forward them to our office. If necessary, we can arrange to perform our own digital radiographs. Our digitally enhanced X-ray images provide minimal exposure. Please alert the office if you have a medical condition that may be of concern prior to treatment (i.e. diabetes, high blood pressure, artificial heart valves and joints, rheumatic fever, etc.) or if you are on any medication (i.e., heart medications, aspirin, anticoagulant therapy, coumadin, artificial joint replacements, etc. ).